Kellyanne Conway has been one of the most public and powerful member of President Donald Trump's inner circle, but while she has won Trump's favor, she hasn't won over everyone yet. A new AOL News poll finds the majority of people surveyed said they held an unfavorable view of Conway. Of those polled, 59 percent said they currently view Conway negatively while 35 percent of respondents view the former Trump campaign manager favorably. Six percent said they weren't sure. Conway has been a frequent voice on cable news since 2016, acting as a Trump spokesperson and often speaking on behalf of the new administration. Those repeated appearances have also led to a few public hiccups during the first 50 days of the Trump presidency, causing Conway to garner national headlines of her own. Shortly after Trump took office, Conway sparked nationwide backlash when she told Americans to "go buy Ivanka's stuff" after Nordstrom's announcement that they will no longer carry Trump's line in their department stores. While many suggested it may have been an ethics violation, the White House ultimately concluded Conway acted "without nefarious motive" and no consequences were announced. Following the Ivanka Trump plug, Conway seemingly slipped up again during a MSNBC segment. The day before Flynn resigned, Conway said that Flynn had the president's "full confidence." 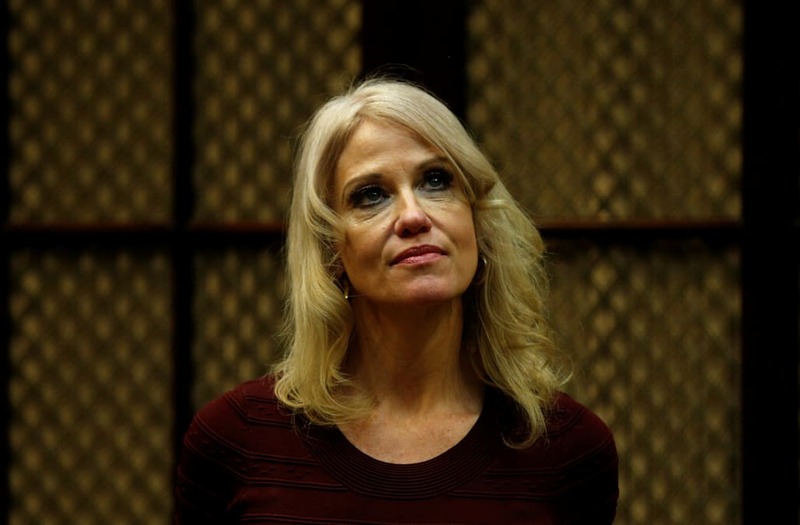 Conway denied reports that she was "sidelined" from television appearances after the comment. Conway was also recently criticized after she was photographed with her feet on a couch in the Oval Office. The senior adviser issued an apology, saying she "meant no disrespect." The adviser most recently made headlines with her comments on the Obama administration's surveillance of the Trump campaign. A NJ newspaper published an interview with Conway on Sunday, during which she insinuated the surveillance was even further reaching than what Trump had previously indicated. She quickly responded, saying her comments were misconstrued. ** Polls conducted by AOL.com do not use scientific sampling. Surveys sample thousands of users and consistently reflect results to polls administered by other outlets.